The following illustration shows the main environment. The user interface has been significantly redesigned in Board 7, the first change you will notice is the replacement of the icons menu with the ribbon bar. The ribbon bar is and new standard of user-interface, designed to help you quickly find the desired commands. Commands are organized in groups, and groups are collected under tabs. Each tab relates to a set activities logically related or commands which are likely to be used jointly, such as creating and formatting a report. Some tabs are context sensitive, meaning that they are shown only when you select an object to which the commands can be applied. 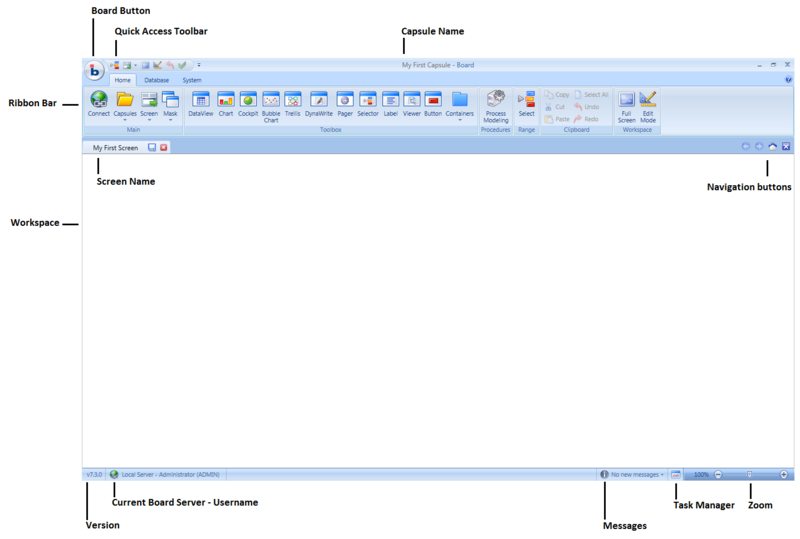 For example, the Format tab is shown only when a presentation object such as a chart or a report are selected. The Board button , provides access to some basic commands are listed such as the Connect command to log-on a Board server, the Open Capsule or the Print screen commands. To start working, click the Board button, then the Connect icon to log-on to a Board server then select the Open Capsule option to open the desired Capsule. A selection of demonstration capsules and databases can be downloaded from the support area of Board's web site (http://support.board.com). The Home menu of the ribbon bar contains commands commonly used for creating a Capsule and designing screens with reports, charts and other data presentation objects. The Database menu of the ribbon bar contains commands for creating and maintaining Board's databases such as creating entities and InfoCubes. The System menu of the ribbon bar contains commands for administering the server such as creating user accounts, defining security profiles and assigning privileges. Depending on the user license, some commands may be disabled, for example all database design commands require a Board Developer license.